"Rebellion and Counter-Culture: Create an item that pays homage to fashion rebels and clothes that flaunt their place on the fringes of standard sartorial society, or that was signature to a rebelling cause." 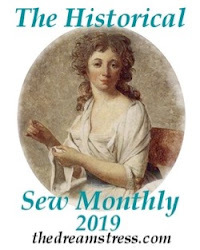 My 1520's gown is not a fashion rebel, if anything I have made it quite conservative, but now it's time for a bit of history lesson. Falun, where I live in Sweden, grew up around the copper mine. 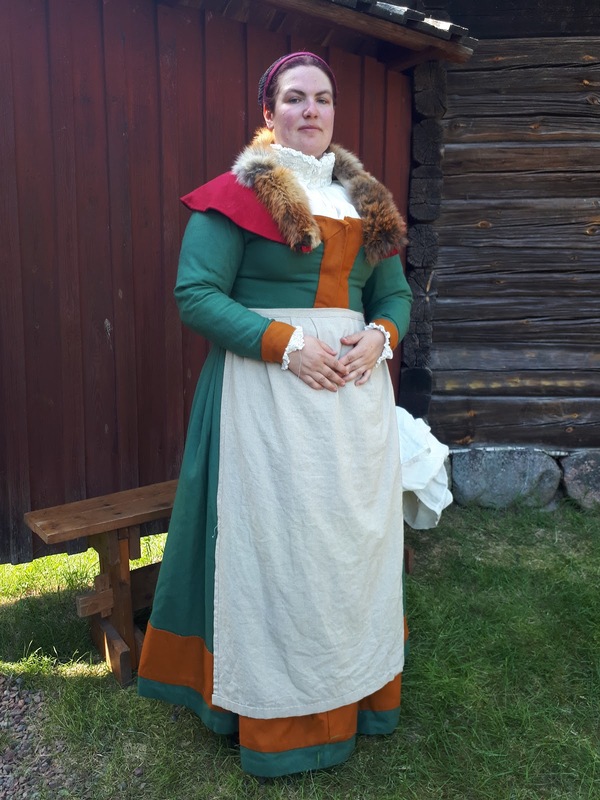 It was in use from the late Viking Age up until 1992, and even if would have its heyday in the 17th century it was an important part of the Swedish economy already by the late 13th century. In the 15th century the master miners, the shareholders of the mine, built up wealth enough to be able to arm themselves. 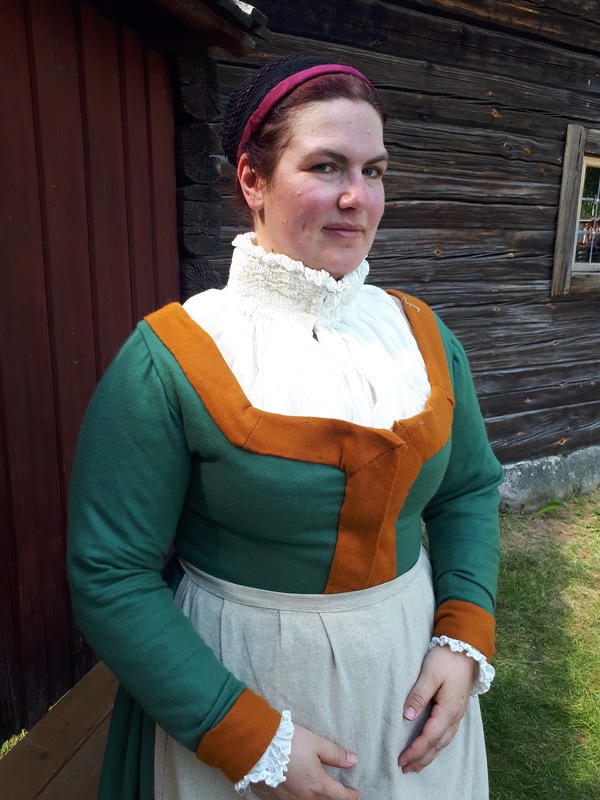 They were also a class of people well connected to the German trading towns around the Baltic Sea. At the same time Sweden-Finland did go through a time of turmoil, with basically armed conflicts and civil war raging for most of the century. The Master Miners' support were sought and feared by the different factions in the conflicts, since they could easily stand up a sizeable army made up of their armed mine workers. This lead to the Master Miners getting used to have a say in the politics. This period of political influence ended in the 1530's when the Gustav Vasa first went up to Falun, and the region of Dalarna, to get support for his rebellion against the Danish king. The rebellion was a success, Gustav Vasa became the new king. 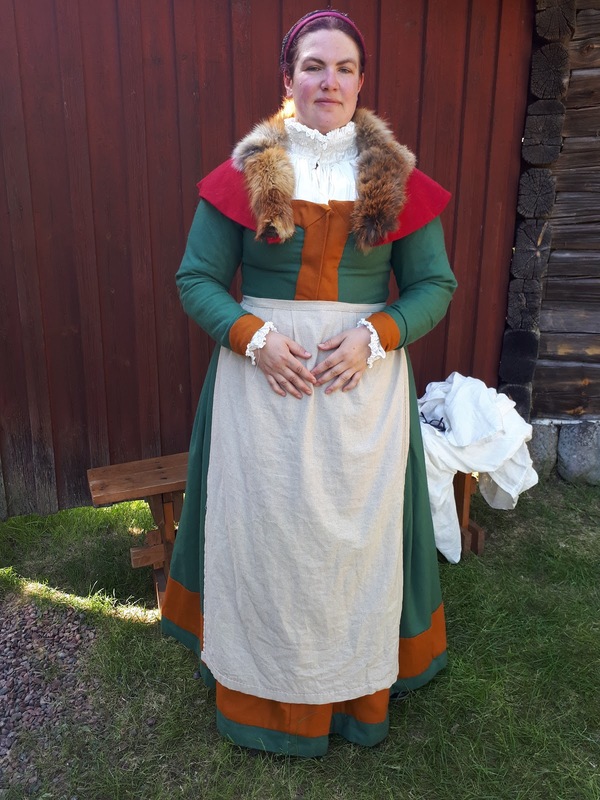 The people of Dalarna weren't very happy with some of the king's rulings though, and three times they rebelled against the king. In 1533 the king travelled up to Dalarna and subjugated the whole region, and executed the leaders of the rebellions, including some of the most prominent Master Miners. Later history writing has made the difference rebellions in Dalarna part of both the regional and national mythos, so there is a lot of connection to the theme of "Rebellion". I have based my outfit on what would have been a suitable dress for a Master Miner's wife or daughter in the 1520s, when they were at their height of politicial power and ready to rebel against anyone interfering with them. I have discussed my design choices in this post. The gown is made in green wool flanell, with guards in the same material. The bodice consists of one backpiece and two front pieces. I made the pattern for the bodice by cutting out a general shape, and then having help to pin it into a model that I wanted. It is closed with hook and eye. 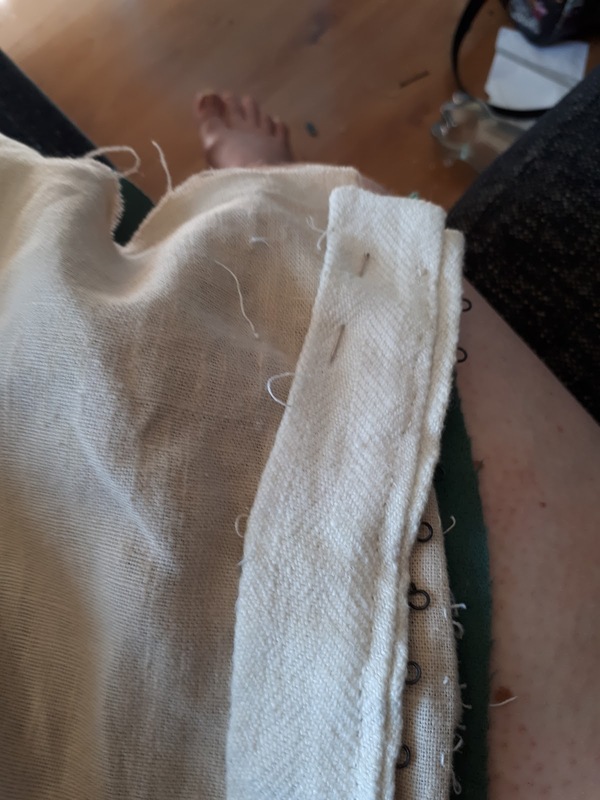 I made my own hook and eye tape by sewing them to two strips of very sturdy linen. 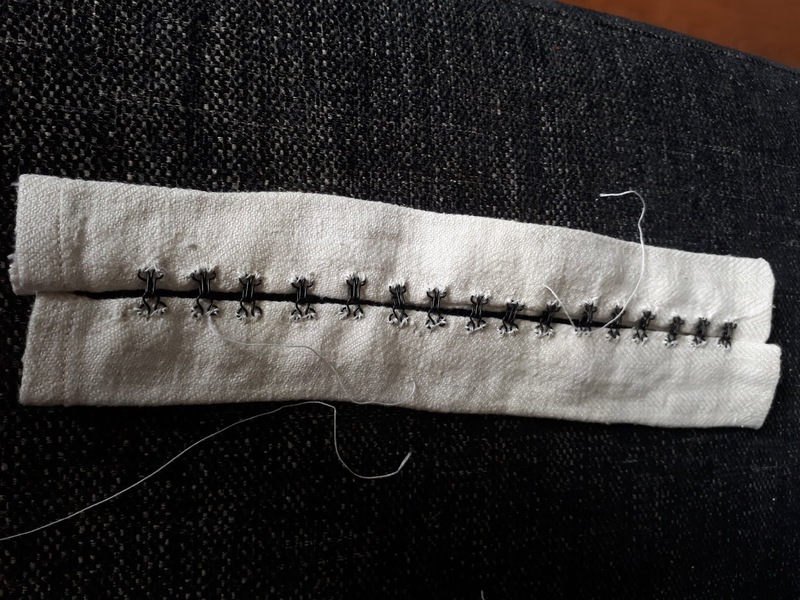 By having the hook and eye on separate strips it was also easy to adjust the fit of the bodice, by changing their positions. 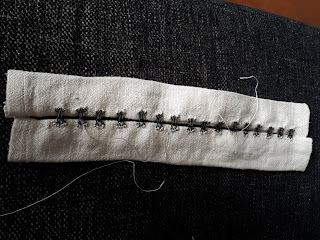 Here you can see that I had to sew them further in under the bust, but let them out at the bust, or else I would looked totally flat in front. They stick out from the main fabric, but is hidden under the guards. The skirt is pleated into the waist with wide knife pleats. I was so very happy with the sleeves. I think this is the first time I have gotten sleeves where I have full movement, and they are not too tight. 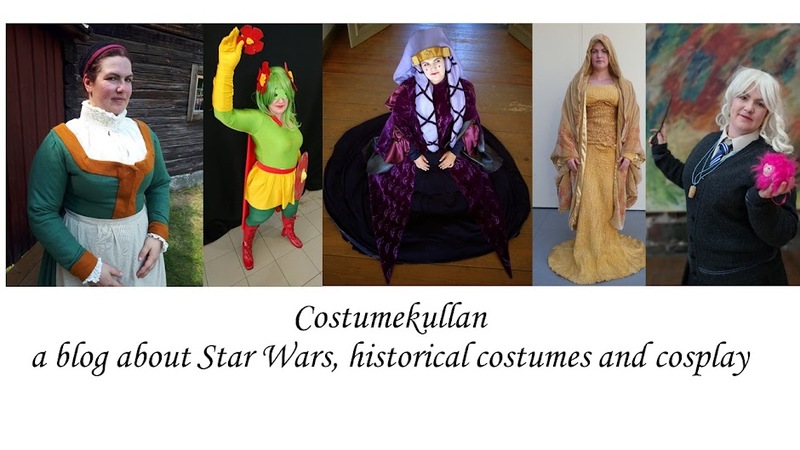 The secret - I found this tutorial from the Completely Dressed Anachronists. It is the first tutorial where I found it took my beefy upper arms into account. I can still make it even better, to remove the small wrinkles, but I'm so happy with it. Together with the gowm I'm wearing 5 out of 6 HSM challenges for the year (my hairnet, my shift, my apron, my gollar ). I'm also melting since it was almost 30 degrees Celsius. How historically accurate is it? I would say 80 percent, it's all handsewn but the hooks and eyes are modern, and there might be other details wrong as well.